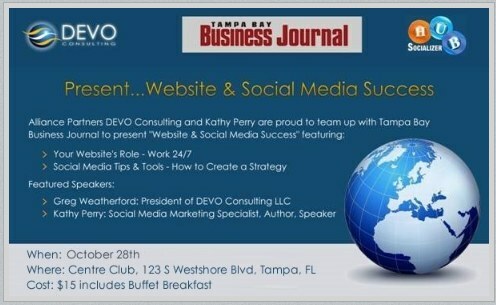 Devo Consulting and Kathy Perry Team up for a Workshop on Websites & Social Media for Success. The workshop is being sponsored by The Tampa Bay Business Journal and will be held at the Centre Club in Tampa on October 28th from 7:30am-9:30am. Devo will be covering information about your Websites role to work 24/7 and that you need to think of it as an extension of your staff. Kathy will be covering Social Media tips and tools and how to create a strategy that makes sense for your business.